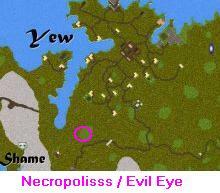 The City of Necropolisss is South of Yew about 5 minutes from the moongate. It is made up of several public buildings, and several guilds. Always seems to be someone around Necropolissss. Link goes to dragongames.com but the “catskills” section no longer exists.